It’s the highest mountain peak in Switzerland accessible by train. At 3,454 metres above sea level, Jungfraujoch, commonly referred to as the Top of Europe, towers majestically over the alpine village of Grindelwald in the Bernese Alps. Peaks of this dizzying height normally can only be reached by expert climbers. But Jungfraujoch can be accessed by anyone thanks to a unique railway line. A little more than a century ago, Jungfraujoch’s isolation was broken by the construction of a cog railroad that finally made it possible for travellers to reach this eternally snowbound universe. At last they could savor its incomparable beauty and utter stillness. 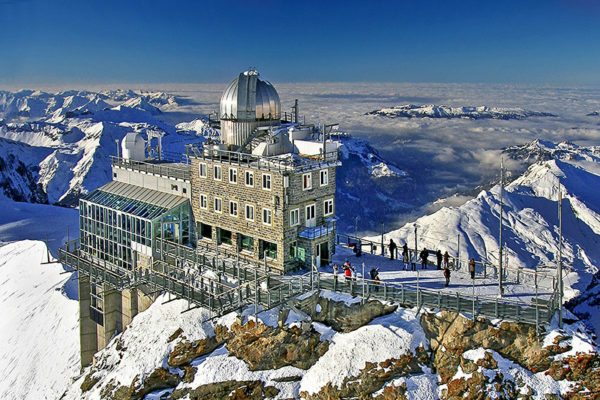 There is no higher railway station in Europe than Jungfraujoch, one of Switzerland’s greatest attractions. Visited daily by tourists, it offers a traveller spectacular and ethereal views in clear weather. Reaching Jungfraujoch requires time and patience. 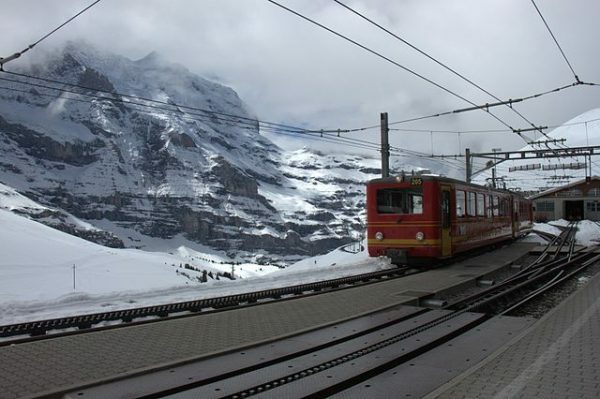 From Grindelwald, you take a train to Kleine Scheidegg, a pretty, somnolent resort above the tree line. From here, you switch over to a brown-and-cream train that climbs 1,370 meters, some of which through a series of tunnels. The next stop is Eigerwand, followed by Eismeer. At each station, you can disembark and feast your eyes on verdant valleys and snow-clad mountains. From Eismeer, Jungfraujoch is an hour away. A high-speed elevator whisks you to the Sphinx Terrace, which offers breathtaking views of the brooding Eiger and Monch peaks. As I shivered in the cold, I watched a group of intrepid skiers, accompanied by a frisky St. Bernard dog, ski merrily down the 16-kilometer-long Aletsch glacier. Around these parts, skiing is possible the year round. And on fair days from June until October, husky dog rides are available. Another place well worth visiting is the Ice Palace, which cuts through a glacier of solid ice and offers ice sculptures of cars and bars. The air is thin at these altitudes, and if you exert yourself too much, you’ll find yourself gasping for breath. So ease up your pace. As one guidebook puts it, “Please forget that you are young.” Another piece of advice: bring warm clothing. It’s always frigid in this blindingly white world of ice and snow. Once you’ve taken in the sights, pause for a break in Jungfraujoch’s restaurant, where you can enjoy a meal of hot soup and a meat platter, which are very invigorating. The pristine landscape of Jungfraujoch, which typifies the Swiss Alps, has inspired painters, poets and writers from Goethe to Byron. 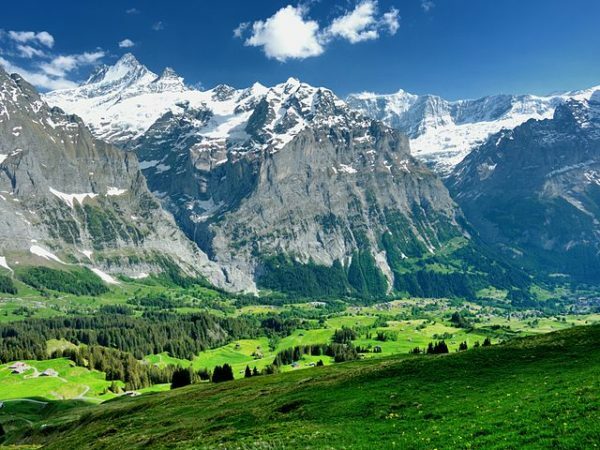 Covering an area of 4,000 square kilometres, the Bernese Alps are composed of nine major valleys and two lakes and are dotted with scenic towns such as Wengen, Murren, Gstaad, Interlaken and Grindelwald. During the spring, when the region is magically transformed into a garden of wildflowers, you can hike on clearly-marked trails. If you’re physically fit, you can attempt to climb mountains. 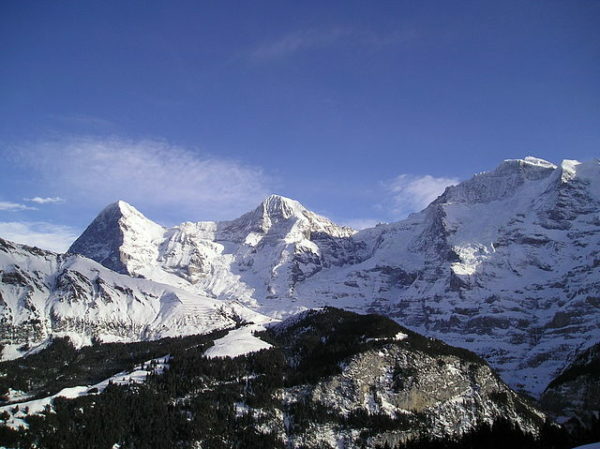 In winter, skiers invade the Bernese Alps, which are locally known as the Bernese Overland. 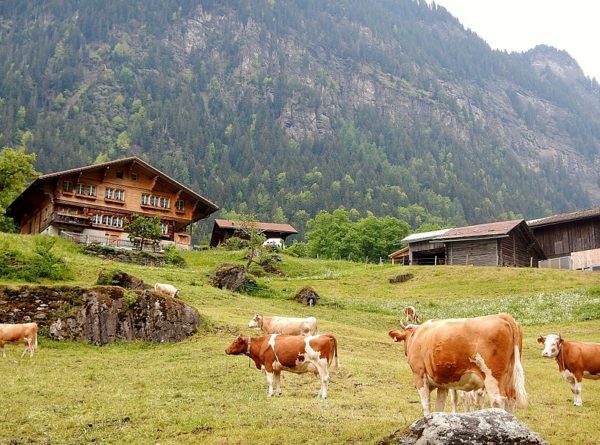 I used Grindelwald, a picturesque village, as a base from which to explore a small segment of the Bernese Alps. Visiting the lookout at Pfingstegg, I leaned over the railing and gazed at the valley where Grindelwald nestles peacefully. Due to a late winter snow storm, I was unable to use the trails, and had to walk back to Grindelwald. The premiere attraction in Grindelwald is the First cable car — the longest in Europe. The lift, which is on the outskirts of the town, carries you past five stations, to an altitude of 2,163 meters, in about 30 minutes. On the way down, I got off at First. There, on a ledge from which I could see awesome glaciers, I watched sky divers running madly down an incline until they were airborne and yelling in ecstasy. Having fortified myself with a cup of hot chocolate, I headed toward Grindelwald, strolling along quiet pathways bordering cool, scented pine forests and a gurgling stream. The sheer beauty of the surroundings was heavenly. I could have lingered there for hours, but left because dusk was approaching.